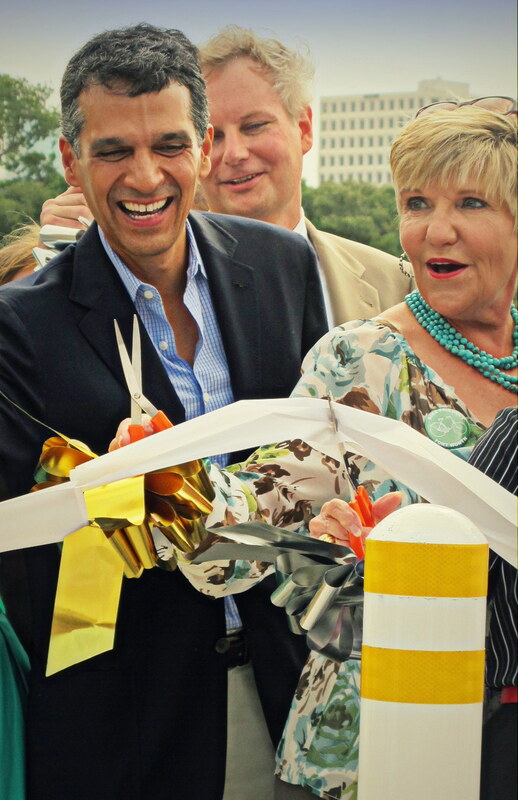 Boston architecht Miguel Rosales and Fort Worth Mayor Betsy Price cut a ribbon to officially open the Phyllis J. Tilley Memorial Bridge over the Clear Fork of the Trinity River. An elegant little bridge, a new landmark for Fort Worth, opened over the weekend, and cyclists are hurrying to try it out. 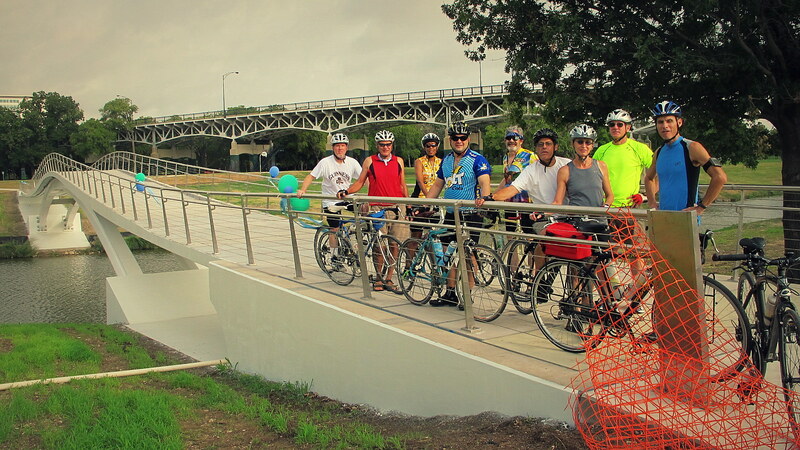 A group of Night Rider friends and I rode our bikes on Saturday morning to the dedication of the Phyllis J. Tilley Memorial Bridge across the Clear Fork of the Trinity River. The bridge, for cyclists, walkers and joggers, is a key new link in the Trinity Trails network. It connects to a new trail on the east side of the river and provides easy passage between downtown and the museums of the Cultural District. I rode to the bridge again on Sunday morning with our neighborhood biking group. And the Night Riders, who ride on Wednesdays and Sundays, tried out the bridge on Sunday evening. Already, it’s becoming a magnet for cyclists. 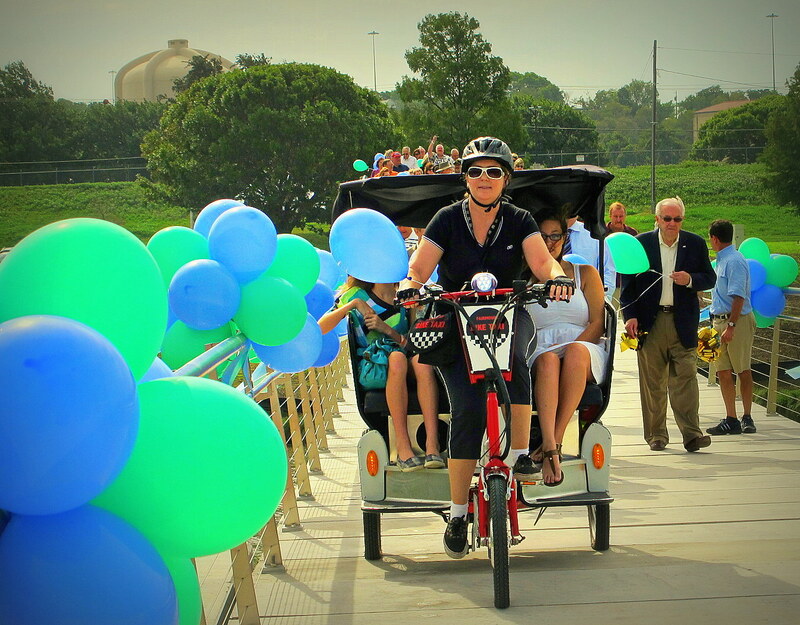 Mayor Betsy Price, an avid cyclist, City Councilman Joel Burns and other local dignitaries officially opened the 386-foot span on Saturday morning as spectators released dozens of green and blue balloons into a sky that threatened rain. 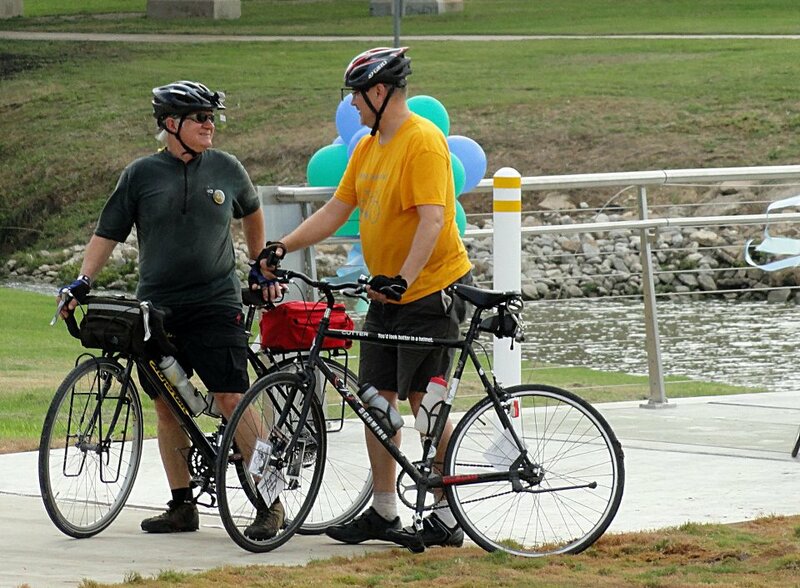 Cycling friend Paul Halicki (right) and I at the Phyllis J. Tilley Memorial Bridge. Photo by Scott Strom. Robin Glaysher, owner of Fairmount Bike Taxi, carries dignitaries across the new Phillys J. Tilley Memorial Bridge in one of her pedicabs. Streams and Valleys raised about $200,000 in private donations for the $3 million project. Funding also included federal grants administered by the Texas Department of Transportation and bond money from the city of Fort Worth. The design of the arch-supported “stress ribbon” bridge, said to be the first of its kind in the United States, was a collaboration of Fort Worth engineering firm Freese and Nichols, transportation architects Rosales + Partners of Boston and the structural engineering firm Schlaich Bergermann & Partner of Stuttgart, Germany. Some members of our neighborhood bike group on the Phyllis J. Tilley Memorial Bridge on Sunday morning. Before the bridge opening, bicycle commuters on the west side the river could ride to the confluence of the Clear and West forks of the Trinity at the northern edge of downtown and climb a steep hill on North Taylor Street to reach most downtown workplaces. Or they could cross into downtown on the West Seventh Street bridge, a heavily trafficked thoroughfare for motor vehicles. Now, commuters coming from the west side of the river can cross the Phyllis Tilley Bridge, take a left onto the new trail along Forest Park Boulevard and ride to West Fifth Street for safer and easier access into downtown. Downtown Fort Worth, of course, is on high ground above the river. So there is still a climb up West Fifth Street from the river, but it’s much more gentle than the very steep climb up North Taylor. So get out on your bike and try out the new bridge. It’s pleasing to the eye and a nice new way into downtown. 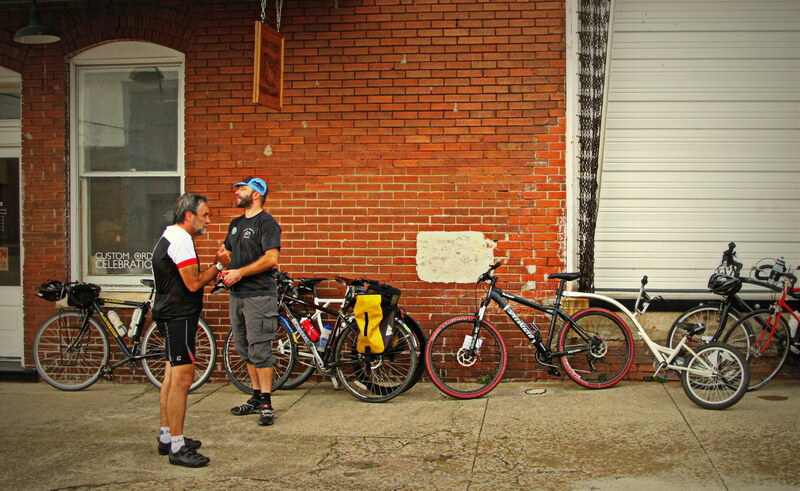 Night Rider friends Dave Hickey and Mark Troxler outside Stir-Crazy Baked Goods on the Near Southside where our group stopped for refreshments before riding to the dedication of the Phyllis J. Tilley Memorial Bridge. Hi, I have been following your blog for quite a while and seen allot of good post. But this one really does take the cake, how long did it take you to write this? 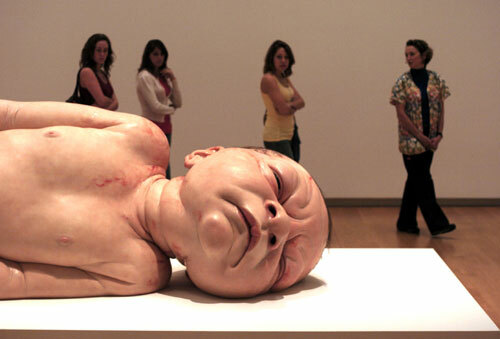 Lovely Site, Preserve the great work. Regards!